My son (5): daddy? What are you doing? Is that chocolate? Today I venture again in turbulent chocolate waters. We are talking about Chocolat Blanc. Yes, white chocolate! My son: Look look, daddy has chocolate! Daughter one (3): is that chocolate? Son + daughter together: CAN WE HAVE A PIECE? Yes, white chocolate. Cédric de Taeye offers two versions. One with Madagascan vanilla and one with pink salt from the Himalaya mountains. Both intrigued me and Cédric offered me the salty one. 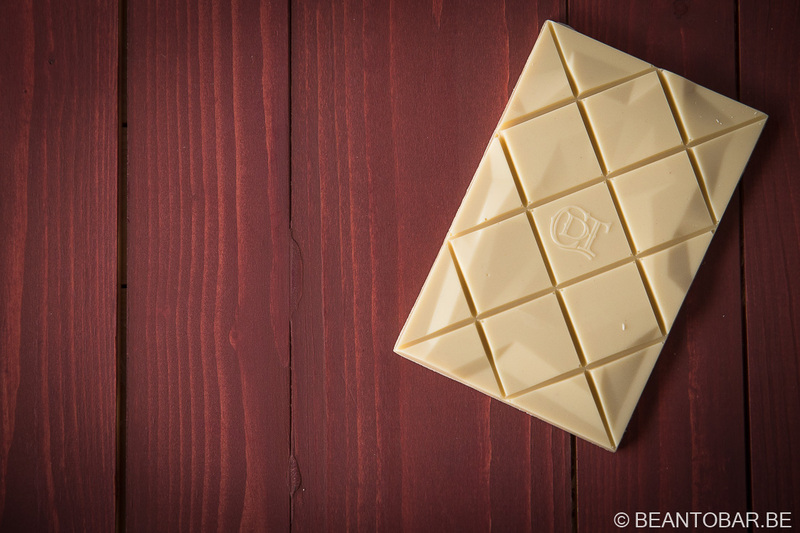 Many people don’t think of white chocolate as real chocolate. The industrial version is often extremely sweet and sticky and not enjoyable at all. But what happens if you have a bean-to-bar chocolate maker having a go at it. Daugther two (1): COCO!!!! Have? Me: sigh… sure little one. Cédric uses non-treated, non-deodorized cocoa butter from Colombia, milk powder and a pinch of pink salt. Simple and straightforward. My wife (39) and daughter three (16): what are you reviewing? Oh, can I try a piece? Me: off course you can. All my kids together: can we have some more? Cédric’s product have been featured before on this site and you’ll find more background info on his products and set-up. He offers a really great range of origin chocolates. Anyone who wants an overview of what the flavors of cocoa can bring, can find a really great introduction in his product line. I see his chocolate popping up in more and more places, even in Amsterdam during the Chocoa event, where the chocolate machine seller Selmi showed a number of products made by their costumers and Cédric’s bars were present. Go team Belgium! Again all my kids together: you still have some…. may we have a piece? Quickly, before the entire bar is gone, let’s hop over to the actual tasting part of this review. The classic Cédric de Taeye package features ivory white and green colors. 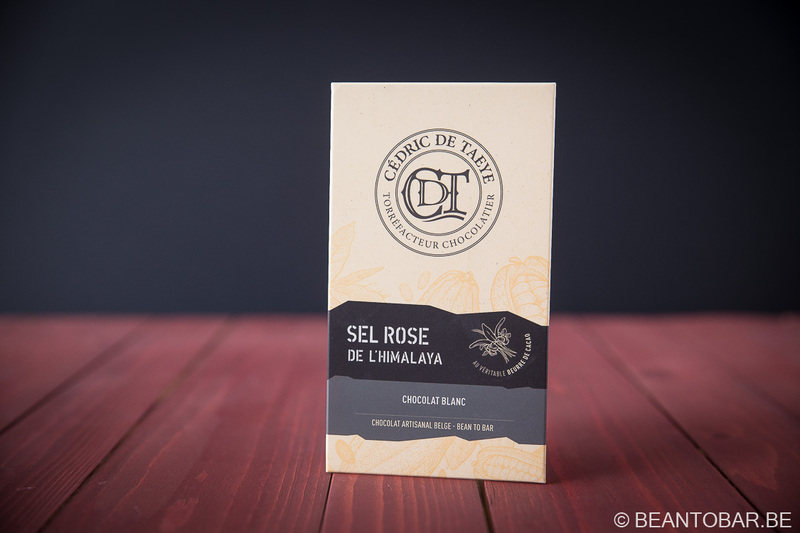 Sel Rose de l’Himalaya and Chocolate Blanc make clear what to expect. On the back, the ingredients list and nutritional facts. The ingredients are cocoa butter, milk powder, sugar and Himalayan salt. No vanilla or other flavorings, pure and simple. Nothing to hide. Inside the wrapper, Cédric states it is a white chocolate in all simplicity, with a twist of salt to create a sweet-salty tension. The bar has the custom made relief design and looks great. The white chocolate version looks creamy and inviting. 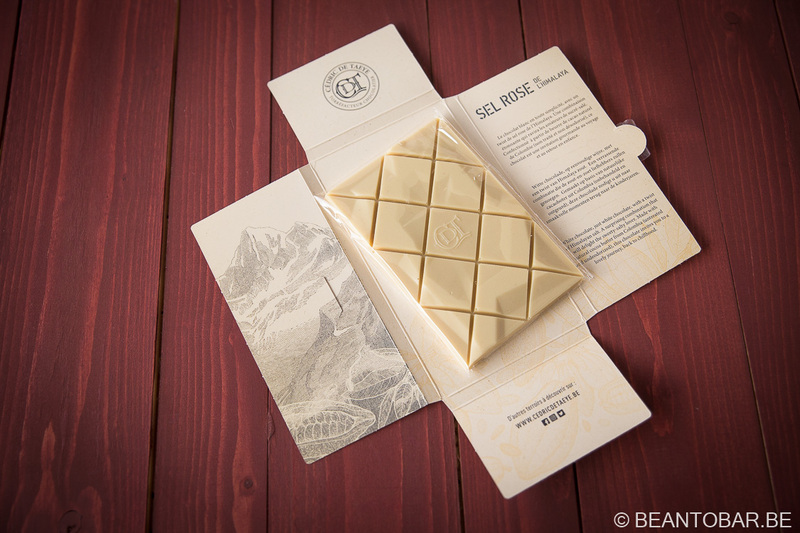 Though it doesn’t add anything to the flavor, a special bar design adds to the total experience of tasting a quality chocolate. Taste: a puff of salt precedes the gentle flavor of the white chocolate. The flavor starts with a creamy note, followed by a whiff of vanilla rolling over to light caramel. There is a distinct cocoa note present. The chocolate isn’t sweet at all, a welcome difference compared to the sticky, overly sweet, flavorless white chocolate produced by the big industry. The salt gives an extra pinch of flavor. Texture wise it is a bit softer than regular dark chocolate, but it melst neciely on the tongue. Given it is made from pure cocoa butter as main ingredient, it is surprising the chocolate isn’t clingy of filming in the mouth. The somewhat coarser salt particles create a nice texture difference, which fades as the chocolate melts. The after flavor is delicate and remains creamy, but it can’t reach the length of a nice dark chocolate.. It is difficult to convey what this chocolate actually does to me. It is not complex at all. It is gentle and creamy, there is a bit of cocoa lingering in the back. But it is not overwhelming or overly exciting as such. Yet from the moment I put a piece in my mouth, it takes me right back to my childhood, when the first thing I would go for on a sunlit easter morning, would be the white chocolate egg. A rare treat that wasn’t available all the time. Le chocola blanc de Cédric brings memories of a time when everything was simple and straightforward. A time when you liked something, but didn’t give it second thoughts. Happy times. This piece of chocolate has an emotional impact. Pretty special if you ask me, for just a self-proclaimed simple chocolate. And final evaluation points aside, I must admit I only had 4 squares left of the bar by the time I did my review tasting sessions. All the others were enjoyed by all the members of my family, from 1 tot 39 years old. Can a chocolate get a better recommendation than this? I hardly think so.